The end of 2018 is nearing and just one and a half months away, Ethereum begins its downward slide. Ethereum has hit an all-time low for 2018, losing 38% price value in just seven days. However, Ethereum isn’t the only one affected as the entire cryptocurrency market has dropped, leaving smaller alt coins nearly worthless. The glacier for this sinking ship: Huge BTC sell-off which dropped Bitcoin’s price per coin valuation below $6,000, and the hard fork in Bitcoin Cash, i.e. hash war. Ethereum fell to an 18-month low as cryptos across the board dropped. 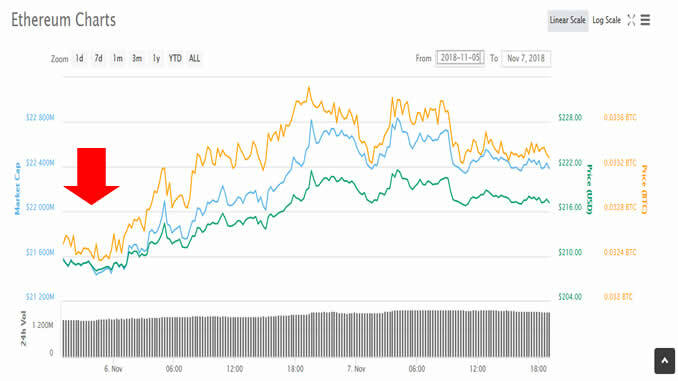 Ethereum’s drop noticeably began November 18th and 19th. Ether’s rapid descendent showed a price drop at 10% then 11% and so on within a few hours. With the ETH market cap falling to 16.5 billion some critics have suggested ETH change its name to “DETH” to imply the potential fall from grace this cryptocurrency may experience. Cryptocurrency investors are hoping the slide will end soon. However, numerous exchanges have begun labeling cryptocurrencies as high-risk investments in an attempt to shy investors away from the falling crypto market. While these exchanges are making investors aware of the current chaotic situation, they may be pressuring their own weariness for cryptocurrencies onto investors by marketing altcoins as unsuitable stores of value. Other altcoins like XRP, Litecoin, Monero, and more were hit during the market slide and lost nearly 10% in value per coin. While Bitcoin is to blame for this crypto winter and pricing avalanche, cryptocurrency Tether is staying above water. Nonetheless, the general cryptocurrency market is trading at their lowest levels in 2018 after seeing nearly $70 billion leave the market in less than a week due to huge BTC sell-offs. Cryptocurrency coin prices have not seen these price levels since last year including Ethereum who has not seen their price fall below $160 per coin since summer of 2017. Currently, ETH is trading at its lowest 2018 price. This instability could lead to investment withdrawal in the coin’s potential future as a decentralized application for businesses. Could this be the death of Ethereum or will the coin rise again like a phoenix? Only time can tell.